Applied Learning Student of the Year Emily Stichter, left, and Intern of the Year Jessica VandenBoom were honored recently at the Grace College Influence Awards Luncheon. 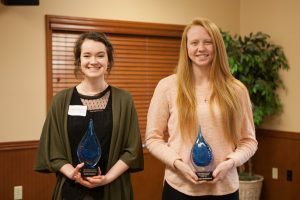 Grace College recognized students Emily Stichter and Jessica VandenBoom, and Warsaw, Ind., area businesses MudLove and Polywood, at its Influence Awards Luncheon on April 10. The annual event honors outstanding interns and applied learning students along with the employers where they work. VandenBoom, a junior majoring in facility and event management and marketing, was selected for her outstanding work at Phoenix America. The Fort Wayne company manufactures encoders, sensors, and magnetic compounds. VandenBoom was in charge of updating the website, which is the company’s primary way of presenting their product to the world. VandenBoom’s work included using 3D-design tools for the website, which she taught herself how to use with no prior experience. Emily Stichter, a visual communications design major, was awarded the 2018 Applied Learning Student of the Year for her focus on detail and tireless work ethic at RedBird Studio in Warsaw. Stichter helped publish a children’s book with illustrations by one of RedBird’s artists. All of the studio’s artists are clients of Cardinal Services, which helps people with disabilities to live with dignity, growth, and opportunity. Sixty percent of the income from the studio goes directly to the artists. “A couple of my many takeaways were realizing the importance of being present in the moment and recognizing the power art has to connect us with others,” Stichter said. 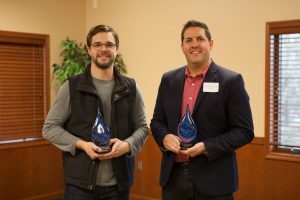 Luke Wright, left, of MudLove and Ryan Zimmerman of Polywood, accept Employer of the Year awards. Polywood of Syracuse was awarded the Intern Employer of the Year. Polywood has a long partnership with Grace College, attending each of the annual Career Connections Fairs with a popcorn machine in tow, as well as making it a point to conduct interviews on Grace’s campus. They prioritize character, competence, and service, some of Grace College’s core values, and they value student interns’ input on projects that matter. MudLove of Warsaw was recognized as the Applied Learning Employer of the Year. The company sells handmade pottery and jewelry, with the proceeds of every purchase providing one week of clean water to a person in need through a partnership with Water for Good. “MudLove continues to partner with Grace by providing unique opportunities for students who are motivated to get work experience, but also want their experience to make a difference in the world,” Muraski explained. Grace College’s applied learning and internship programs are designed to incorporate real-world experience in the college curriculum. All Grace students are required to complete 12 hours of applied learning credits to earn their bachelor’s degree. Grace’s Center for Career Connections has developed partnerships with more than 250 area businesses and organizations from which students may choose to apply their classroom learning and explore their desired career path.